The Eppendorf New Brunswick I24 / I24R Incubated Shakers are compact biological shakers that economically fit on your benchtop. The large clear lid on the Eppendorf New Brunswick I24 / I24R Incubated Shaker enables easy viewing of your culture media or sample during incubation without the need to open the door of the unit. 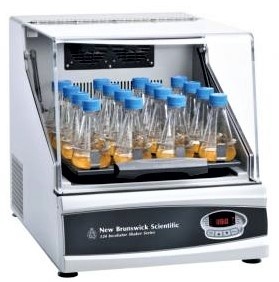 The Eppendorf New Brunswick I24 / I24R Incubated Shakers are available with incubation only or incubation and refrigeration combined in the I24R model. These Eppendorf New Brunswick I24 / I24R Incubated Shaker models feature the New Brunswick triple-eccentric counterbalanced shaking mechanism for uniform motion and years of quiet, dependable operation. Microprocessor controls with digital display enable easy operation and accurate setpoint regulation by the user. A large selection of platforms, clamps, test tube holders and other accessories are available and allow personalized configuration to meet your specific needs. Microprocessor controls precisely regulate the temperature, speed and running time of the Eppendorf New Brunswick I24 / I24R Incubated Shaker. The large 18 in x 18 in accessory platform (sold separately) accommodates flasks up to 3 L in volume. The user-friendly keypad with the large LED display is clearly visible and makes it easy to set parameters. Audible and visual alarms alert you to setpoint deviations or end of the study. A wide selection of interchangeable platforms accommodates varying size clamps. Wide temperature range of the I24: 7 °C above ambient to 60 °C. (for the I24R: 15 °C below ambient to 60 °C). Powerful fan and heater provide rapid heat up and temperature recovery after door opening. RS -232 interface for data logging directly to your PC. Provides the ability to calibrate the speed and temperature directly through the keypad. Accepts a wide variety of flasks up to 2.8 L in volume.